On June 13, 2015, Schann Westbrook and her daughter Summer, came to the Cattery to enjoy the day playing with the four litters (Pansy, Hydrangea, Holly and Diamond's babies). During the Photo Shoot we brought Holly in to see her babies and get some pictures. This was the first time she had seen them since they were removed from her the first week. It was a very emotional time for us. I think the photos speak beautiful at what then transpired. Holly knew that they were her babies. Schann, Summer and her friend and I had a great afternoon together. Schann has provided us wonderful memories of the day. Enjoy her special photographs from that day of Holly and Toy's litter. 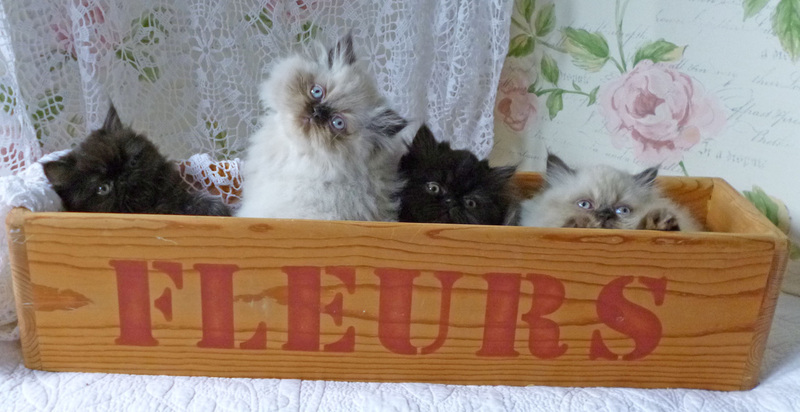 You can catch the full photo shoot of four litters at The Feline Photography of Purry Paw Prints. We have enlarged to the space in Hydrangea's area since most of Holly's babies are now out and about walking. Holly's babies are doing great. I just started them on wet food yesterday. I can not say they really like it at this point since most of the babies are spitting it out. Mid-week, we will start to see if we can potty train them. It looks like Hydrangea's milk is going low so I am stepping up and feeding more. It will be nice when all the gang is weaned and potty trained. Holly's babies came down to the Toddler Room last night and had a great night. They are separated from Pansy's babies by a fence. It is tight quarters with all the toys, babies and fences. Hopefully in a week, I can start weaning Holly's babies. This is a beautiful group of kittens and Hydrangea is a wonderful mother to them. They will be 2 weeks old this coming Sunday. They are getting prettier and prettier every day. I think the Himi is starting to show a little orange on his tail. So he is either a Cream Point Bicolor Himalayan or a Cream Point Himalayan. Since white and cream are so close in coloring, we will all have to wait awhile to find out which he is. His is now starting to take the lead as the biggest of the three but not by much. Holly's three babies are 11 days old. On Day 3 of their lives, we gave Holly's babies over to Hydrangea to nurse and love. Holly is just over one year old and this was her first litter. She stills acts like a kitten. She just was not the best mom this time around so we did this in order for her babies to have the very best care. Hydrangea loves them like they are her own. For her, they are her babies. Holly has a Male Doll Face Himalayan. 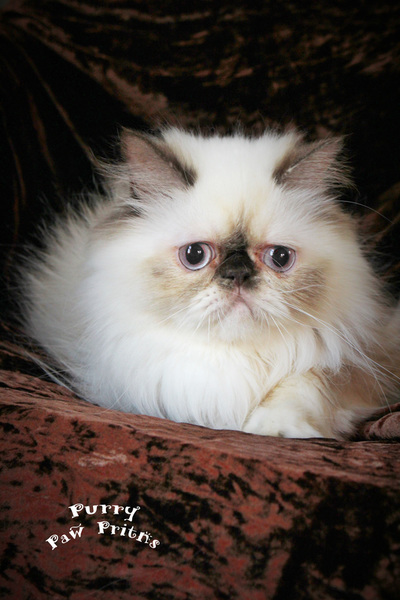 He is either a Cream Point or Lilac Point or those colors in a Bi-Color Himalayan. We probably will have to wait a few more weeks to determine his color. She also has a Male Red Persian Extreme Face. He is a handsome fellow with a nice broad head. He will not take to the syringe supplemental feedings. He wants only Hydrangea's milk. 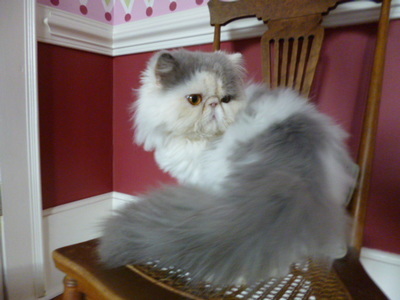 Next, but definitely not least, is a rare Chocolate Tortoiseshell Extreme Faced Female Persian. She will be staying at the Cattery as a future breeder. She also knows when I am in the room and cries till I feed her. She, as well as Hydrangea's daughter, eat like little piggies. You can see the video by clicking on the link below. I am hand feeding Holly's babies round the clock. Holly was not being the greatest mom, so Holly's babies were given to Hydrangea to nurse and take care of. Hydrangea had to slowly build up her milk production. Hydrangea has definitely gotten her stride in the last two days. She is now nursing the group without too much intervention or too many supplemental feedings from me. Holly's Red Persian male newborn definitely has the Classic Tabby stripes "M" on his forehead and bullseye going on. The Cattery's original girl's line, which Holly is part of, does not have the Agouti gene or Tabby gene in its line. It has the non-Agouti gene, which means that the tabby coat is masked by the (red) coloring though at times you will see some tabby markings. A good example is Toshi, a Flame Point Himalayan. His tail shows tabby markings so the non-Agouti gene is not masking completely the tabby stripes. We did not have a DNA test for the Agouti gene done on Toy, this baby's father. He just got the DNA PKD test. All red Persians are tabby in coloring when they are born. A true Tabby is one that has the Agouti gene. So we really can not be sure if he is a Classic Tabby Red Persian or a Red Persian. The only way to truly find out is to pull an Agouti gene DNA test on him or his father. So for now, we are calling him a Red Persian. This big boy is fattening up and starting to look very promising with his broad face. We think he will be an extreme face with probably the deeper crease lines and a smaller nose pad.